Barry M Silk Mist | a stunning light blue with a matte sheen that provides full coverage in 2 coats. Color Club Aquamarine Azulino | is a pearly sky blue with a hint of shimmer that applies evenly in 2 coats. Barry M Elderberry | beautiful pale blue with a hint of grey. This polish is opaque in 2 easy coats and spread evenly. 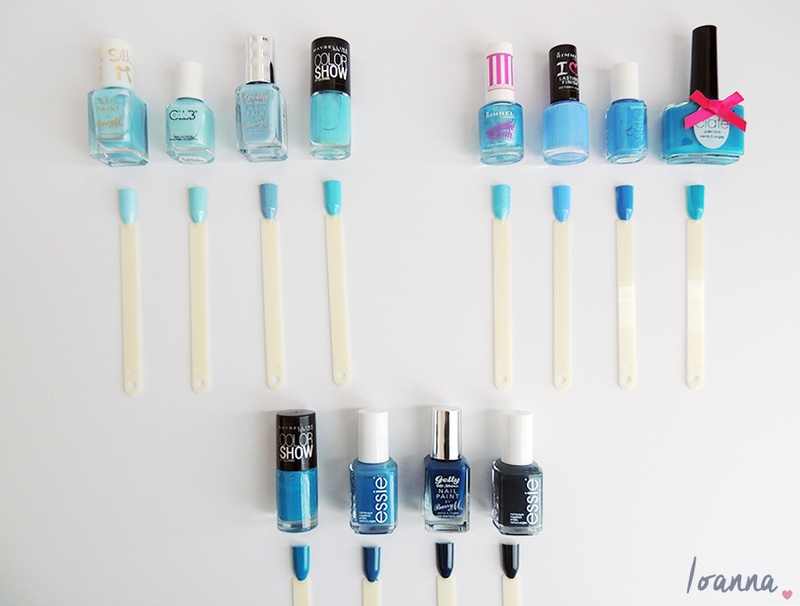 Maybelline Color Show Cool Blue | is a bright sky blue that is opaque in 2 coats. Rimmel Sweetie Crush Blueberry Whizz | a lovely textured mid-blue that requires 3 coats for full opacity. Rimmel Fancy A Dip? | a pretty spring blue that provides full coverage in 2 coats. Essie Avenue Maintain | a bright mid-blue that applies evenly in 2 coats. Ciate Boom Box | a striking bright blue that provides full coverage in 2 coats. Maybelline Color Show Superpower Blue | a delightful bright teal blue that is opaque in 2 coats. Essie Hide & Go Chick | a rich blue that provides full coverage in 2 easy coats. 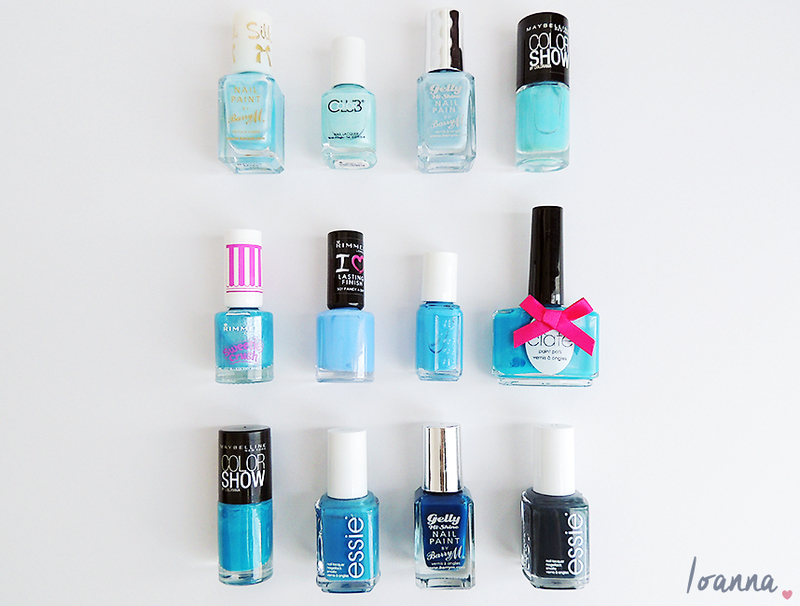 I thought I’d continue to give you a peak into my nail polish collection by sharing all of my blue polishes with you. Don’t they look pretty lined up all together? A sea of blue hues! If I’m honest I didn’t realise I owned this many, 12 blue polishes is quite a lot really but at least I have now rediscovered some old favourites! 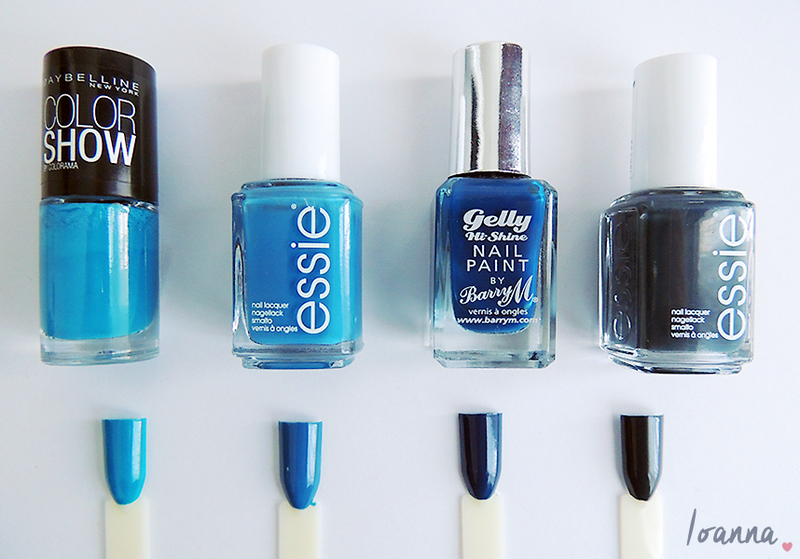 What is your favourite blue polish?